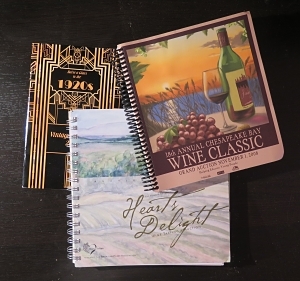 In the video I share information about these three wine auction catalogs. In this video, I pulled three wine auction catalogs from my collection. If you’ve never attended a wine auction, you’ll be interested to hear how different they are from most typical benefit auctions. If you happen to be chairing a wine auction, you’ll enjoy seeing how your own catalog compares to other groups around the country. Everyone has a special way of presenting their collections. P.S. 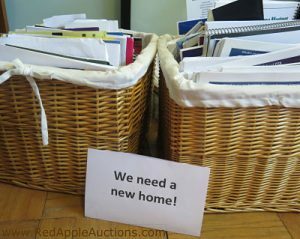 Want some of your own benefit auction catalogs? I can’t promise you’ll get any wine auction catalogs, but from time to time, I do offer catalogs for sale on my website. If any are available, you’ll be able to order the Catalog Carnival. I am interested in the video on your post about wine auction catalogs. It is not loading on my screen. I wonder if you have removed the video or if it is a problem with my machine loading it? Thanks for any help on that. Hmmm. Thanks for the heads up! Not sure what’s going on with the video. I appreciate the notice and will have my team look into it.